Internet4ALL, Ministero dello Sviluppo Economico (MISE). January 2017 - April 2019. AI4EU (A European AI on demand platform and Ecosystem) The AI4EU project is funded by the European Community's Horizon 2020 programme, agreement n. 855619. Starting in 2019. Sapientino, "A scuola di coding con Sapientino" is an educational project aiming at evaluating the impact of using small easily programmable robots to support teaching of curricula subjects in primary schools (5 to 8 years old scholars). Funded by Clementoni S.p.A. March - October 2017. SAMAN, Multi-robot cooperative exploration, search and task allocation, funded by Leonardo S.p.A. April 2017 - November 2017. COACHES, Cooperative Autonomous Robots in Complex and Humans Environments, European project funded by chist-era. October 2014 - September 2017. ROVINA, Robots for Exploration, Digital Preservation and Visualization of Archeological Sites, European Union. February 2013 - July 2016. 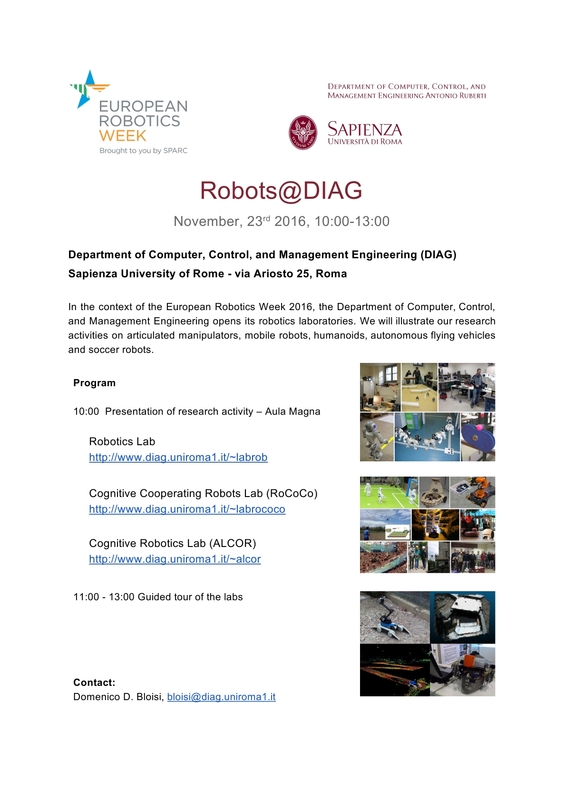 RoCKIn, Robots Competitions Kick Innovation in Cognitive Systems and Robotics, European Union, agreement n. 601012. 2013 - 2015. Speaky Acutattile, Ministero dello Sviluppo Economico (Industria 2015). June 2011 - May 2014. Speaky for Robots, European Union. November 2011 - April 2013. Bee-SAFE, Sistemi Software Integrati. December 2011 - April 2013. Smart Monitoring of Complex Public Scenes, Dept. of Homeland Security (DHS), USA. May 2011 - April 2013. Sistema pubblicità virtuale 3D (VIVA), Duel TV. January 2011 - July 2012. Situation Awareness, Iniziativa Software 2, SESM, SELEX-SI, Finmeccanica. April 2010 - October 2012. CAMP: Context-Aware Mobility Platform, Ministero dello Sviluppo Economico (Industria 2015). Jan 2009 - Dec 2011. MREM: Multi-Robot Teams for Environmental Monitoring, Dept. of Homeland Security (DHS), USA. May 2009 - April 2011. SAMAS: Sistema adattativo multi robot e sue applicazioni per lo sminamento (Adaptive multi-robot services and its applications to demining) Servizi di cooperazione (Cooperation services), Space Software Italia. March 2009 - July 2011. GAPACOM: Sistema satellitare terra/bordo basato sullo studio di un payload NAVCOM innovativo da imbarcare sui satelliti GALILEO (Ground/satellite system based on new NAVCOM payload for GALILEO satellites), Thales Alenia Space. November 2008 - December 2010. ARGOS: Automatic Remote Grand Canal Observation System, Archimedes, Comune di Venezia (ARGOS Venezia). 2006 - 2007. Situation Awareness, Iniziativa Software, SESM, Finmeccanica. April 2006 - April 2009. PEEM: Post-earthquake emergency: Methods, Techniques and Support Instrumentation, Scientific Cooperation Italy-Japan, Italian Ministry of Foreign Affairs. March 2004 - December 2007.